This Cake is warm, moist and fluffy on the outside. A warm chocolate molten lava sauce with the gooey oozing chocolaty center inside. Chocolate outside, chocolate inside - I would say it is DOUBLE YUM! Yesterday marked the Solar Eclipse and the official arrival of spring too. Wohoo! It’s officially spring now! I am so ready & thrilled for this awesome season. Are you? I bet everyone is ready to Rock and roll. If I talk about weather now, it was really beautiful, sunny, and unusually warm last week at this time of the year. Most of the days were dazzling & bright. Around here, I could clearly see that everyone is super duper excited to welcome spring. Nurseries and florists are full of yellow plants and flowers. You can certainly see all those bright flowers almost everywhere up from top, where I live. In two weeks there will be Easter, and after that there will be summer. I can already feel the warmth of summer, and gleaming days. Aaahhhh, I am prospectively in the thoughts of summer. And I am LOVING what I see and feel here. 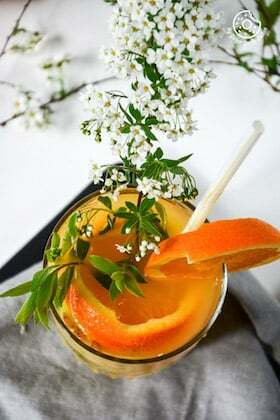 Lets talk about this welcoming spring delight which I am going to share with you today. I made Chocolate Molten Lava Mug Cake to celebrate the arrival of spring. I have told you all a zillion times that I am so in love with chocolates. All types of chocolates are welcome at my home. I think that now is the perfect time to share my favorite chocolate mug cake. I promised to you all in my earlier February post that I would not share any chocolate recipes for while. Yeah! I stuck to my promise, and I did not share any chocolate recipes after Valentine’s day! So, now seems like the best time for it. Full of chocolate goodness—this is an angelic treat for all chocolate lovers. This will give you all the comfort and sweetness you need. This mug cake is awesomely gooey, warm and full of YUM! 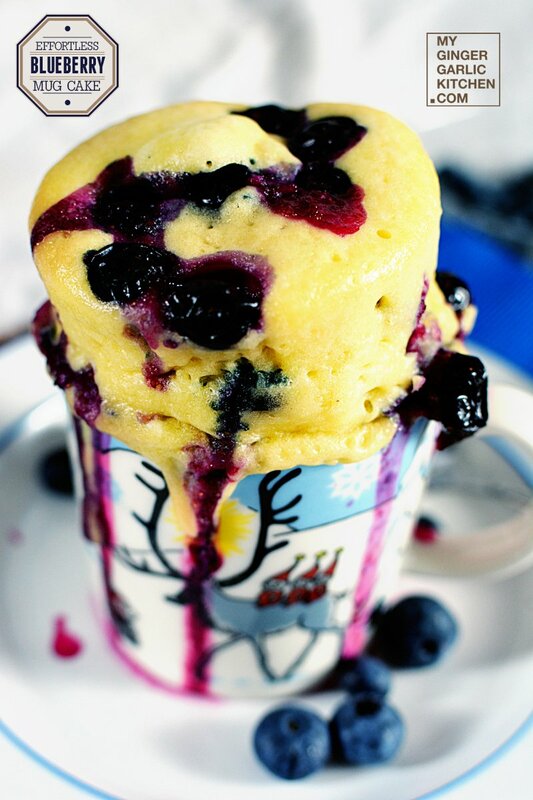 This mug cake is perfect for appeasing your sweet cravings. Perfect for times when you are too tired to make something, and still want to eat some insanely delicious sweet stuff. Sometimes you really have chocolate indulgence late at night, and yet you don’t want to spend so much time in kitchen. I get you there! This mug cake is here to comfort you and make you happy at those times. Plus you don’t have to worry about eating the whole cake, so no regrets after eating this mug cake. It would only take 5 minutes from start to finish. Isn’t it unbelievably quick? YES, it is! You don’t have to turn on the stove or oven to cook this delectable stuff. You will only need a microwave. Now what could be better than this? All sort of mug cakes are just so DELISH. She just loved everything about this cake, and so did Abhishek and I. This Cake is warm, moist, and fluffy on the outside. It is a warm chocolate cake with the gooey oozing chocolate molten lava saucy center inside. Chocolate outside, chocolate inside—I would say it is DOUBLE YUMMY! Just grab a mug, and a couple of more ingredients—this is all you need to make this amazing mug cake. This would come with all the yumminess, and you don’t have to eat the whole cake. I think it’s a fair deal! 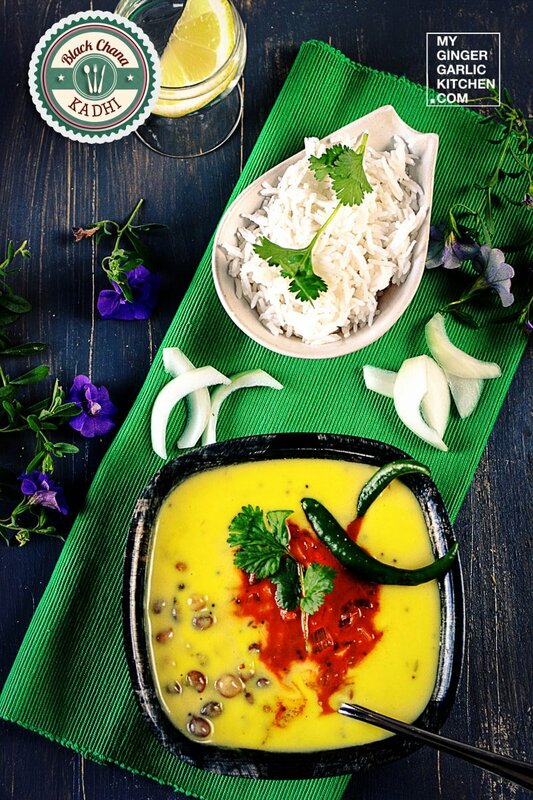 You can indulge those spontaneous cravings without regretting about eating too much! This ooey gooey dessert would work just perfect for the purpose. It literally just takes a few minutes from start to finish. You use just one dish and one fork and ‘nomnomnomnom’! 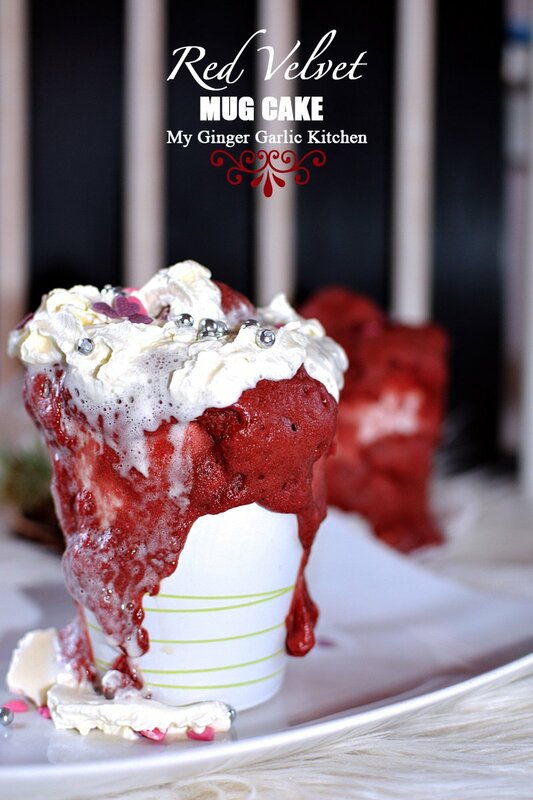 Flavour it with your favourite topping and SLURP!! I have used whipped cream and rainbow nonpareils sprinkles. But you can use any of your favorite toppings. I believe toppings make everything more beautiful and inviting. For me everything is better with the toppings! Let’s learn to make sweet chocolate molten lava mug cake! Take a large mug. Add flour, sugar, cocoa powder, baking powder and salt. Mix well. Add some melted butter and milk, egg and vanilla extract. Whisk well. Add in a few pieces of chocolate. Microwave it for 1 minutes 30 seconds and check. If it is not done cook for 30 seconds more. It should slightly sticky in the centre. Do not overcook, because you want molten chocolate center. Mine took 2 minutes. Take out the mug, and let it rest for few minutes before you attack! This Cake is warm, moist and fluffy on the outside. A warm chocolate molten lava sauce with the gooey oozing chocolaty center inside. Chocolate outside, chocolate inside—I would say it is DOUBLE YUM! Take a microwave safe mug. Add flour, sugar, cocoa powder, baking powder and salt and whisk well until well combined. Add melted butter, milk, egg and vanilla extract. Whisk well with a fork. 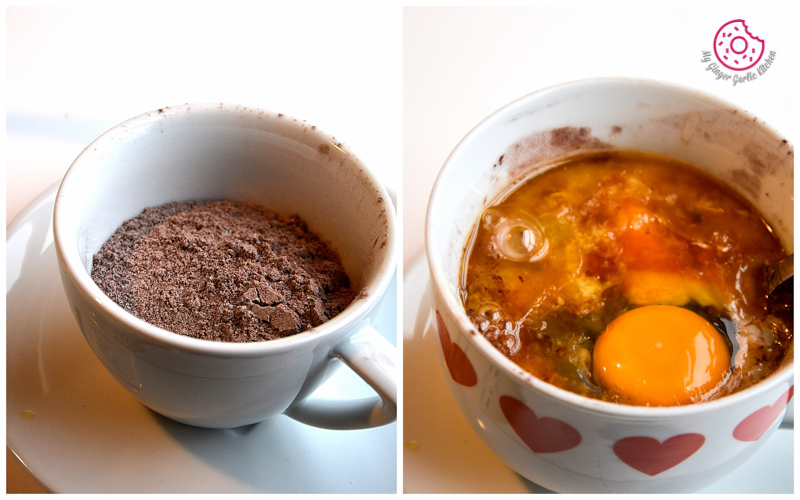 Place the chocolate pieces in the center of the mug. Cook in microwave for about 1 minutes 30 seconds. If it is not cooked, cook for 30 seconds more. It should slightly sticky in the centre. 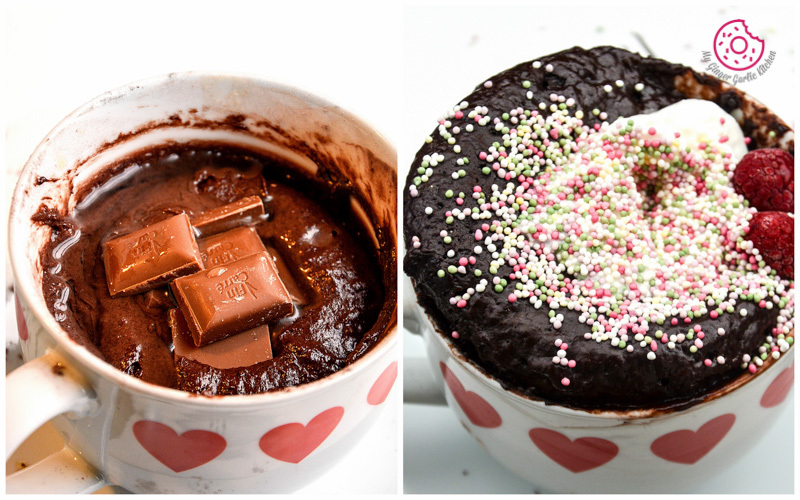 Do not overcook, because you want molten chocolate center. Take out the mug, and let it cool for about 5 minutes. Top with your favorite toppings and enjoy!